It was a good night, must see TV. Halladay looked strong. The bullpen did not look as bad as described, things just got out of hand in the 7th. What made me happiest though was seeing Howard and Rollins contribute key hits in the 9th. Sure the offense as a whole was sluggish, but when these guys are hitting good things happen for the Phillies. Rollins could hardly contain himself from jumping out of the dugout every time someone made contact in the 9th. These guys still have high hopes and now I do too. 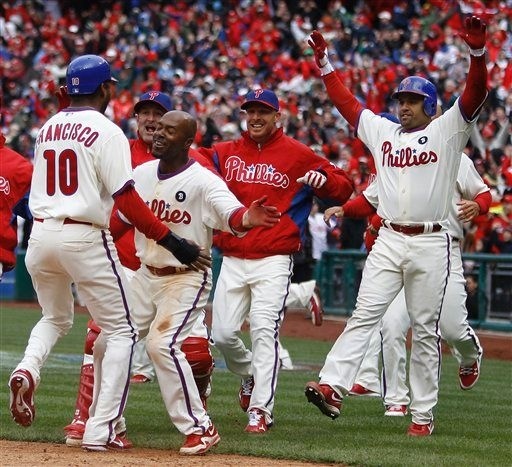 This entry was posted in baseball and tagged Jimmy Rollins, Opening Day, Philadelpha Phillies, Ryan Howard by Steve Clancy. Bookmark the permalink.